Purple hyacinth bean is often grown as a flowering plant, although most of the plant is edible. With shades of purple in the leaves, stems, flowers and showy seed pods, it is undeniably eye-catching. Purple hyacinth bean is a very vigorous grower and the vines are a popular choice for a quick cover, although they can frustrate you by refusing to flower until late in the season. The bright green, pointed leaves grow in leaflets of three leaves. The stems and undersides of the leaves are tinged purple. Flowers resemble sweet peas, without the scent. They grow in loose clusters and come in pale purple and white. They are followed by glossy purple pods that start off looking like snow peas, but eventually fill out and plump up. Most of the purple hyacinth bean seed sold is day length neutral and you should start to see flowers anytime after mid-summer. However, some varieties are affected by day length and are not triggered to begin flowering until the days start to shorten. The purple pods will form shortly after the flowers start fading. No deadheading is needed. Once the flowering starts, you should see a continual display of color. Purple hyacinth bean vines climb by twining around structures and other plants. You can use them to add height to a border, by growing them up a teepee or trellis. They may need some initial training to reach the support, but once attached, they will take it from there. You could let the vines ramble through other tall plants, trees or shrubs, or use them to cover a fence or arbor. Because of their lush growth, Purple hyacinth bean vines make an excellent choice for camouflaging eyesores like air conditioning units. For the best flowering, choose a site that gets full sun. Purple hyacinth beans will grow in partial shade, but along with fewer blooms, you will also have the risk of fungal diseases. A neutral soil pH of 6.0 to 6.8 is best. Purple hyacinth beans don't need overly rich soil, but working some organic matter into the soil before planting will give them a good start. Definitely, choose a well-draining site. Although they need regular water, their roots will rot in overly wet soil. This plant likes lots of water, but the soil should be moist, not wet. Purple hyacinth beans can be perennial in USDA hardiness zones 10 and above. They may even develop woody stems, although they tend to be short-lived. In other areas, they are grown as annuals. Plants may reseed if the pods are left over-winter. It is also very easy to collect the dried seed at the end of the season, to save for next year. Because the vines are so vigorous, give them some extra food every four to five weeks, throughout the summer. Start with a rich soil and give them a monthly dose of your favorite balanced fertilizer, preferably something low in nitrogen and high in phosphorous to encourage blooming. If the vines have few or no flowers, it could be that they are not getting enough sun or they are getting too much nitrogen. Make sure whatever fertilizer you use has a low first number. (5-10-10) and avoid nitrogen supplements like fish emulsion or soy meal. 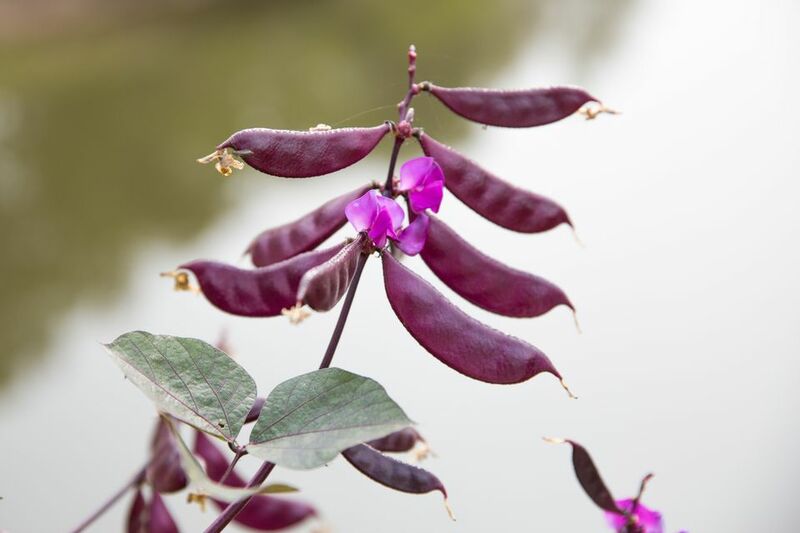 Generally, you will only find seed labeled Hyacinth Bean or Purple Hyacinth Bean. There are a few named varieties out there, but the difference in their flowers or pods is minimal when compared to the generic seed, although some lean more toward red, rather than purple. Occasionally you will see seed for just white flowering vines. The flowers are lovely, but they produce a pale green pod. There is also a yellow variety. You can sometimes find purple hyacinth bean seedlings for sale in nurseries, they are more commonly started from seed. The seeds are very hard and soaking them overnight, before planting, will improve germination. Wait until all danger of frost has passed before direct sowing. The seeds will not germinate well in cold soil and the young plants can be killed by a late frost. If you prefer, you can start the seeds indoors, four to six weeks before transplanting outside. But direct sown seed is easier and the plants will catch up to the seedlings in no time. Plant the seeds 1 to 2 inches deep, spaced about 6 inches apart. If you are worried about poor germination, you can sow the seeds closer and thin them when they are a few inches tall. Seed should germinate within two to three weeks. Expect to get a lot of leafy growth, before flowering starts. Have your support in place when you plant the seeds. Once the vines find the support, they will train themselves to grow up it. If they don't have anything to climb, they will tangle around themselves on the ground. Purple hyacinth bean is seldom bothered by disease or pests. Butterflies may lay their eggs on the leaves and the caterpillars will munch on them, but only for a short period. And when they're done, you'll get more butterflies. Immature, tender pods can be cooked, like green beans. The flavor is much stronger than the common green bean and the purple color disappears with cooking. The leaves and flowers are also edible. Shelled, dried beans require proper preparation or they can be toxic. The shelled, dried seed beans must be thoroughly cooked, changing the water twice, before eating. Uncooked seeds are poisonous, with toxic levels of cyanogenic glucosides. They can cause vomiting, breathing problems and convulsions. Better to leave the cooking to someone experienced with hyacinth beans and save your seed for planting. Is It Possible to Grow Vegetables in the Landscape?